Does your child dare taken on this fearsome Greek mythlogy maze? Featuring a dizzying spiral of twists and turns, plus a snoozing minotaur in the middle, this maze is a great backseat distraction and homework break -- just don't get lost! Enjoy a challenging word puzzle, where your student can read about a few gods from Greek mythology, and then figure out the words that describe them. Work up an appetite for all things Greek, with this word search about Greek food. 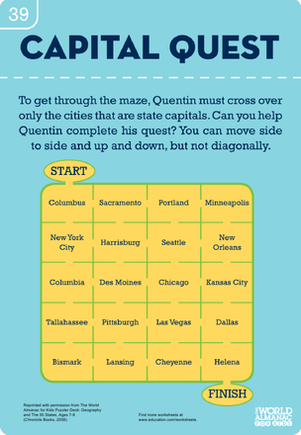 Learn all about the city of Minneapolis with a fun page, including a word search and a maze! 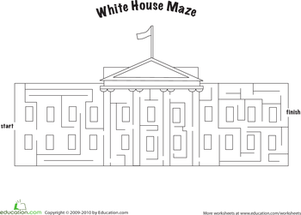 To complete this maze, your child will need to know her state capitals. If your child moans his way through vocabulary practise, this colorful worksheet, complete with a fun maze for a job well done, could be just the thing! After completing an exercise, your student can complete a fun maze of letter Js! 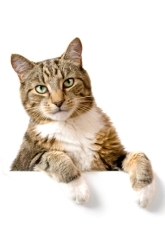 There are short verb exercises, plus a fun letter maze at the end.